Magnesium aluminum ferrite brick has excellent physical properties and good resistance to alkali salt erosion. It is widely used in cement rotary kiln firing zone and is one of the best refractory materials for replacement of magnesium chromate brick. 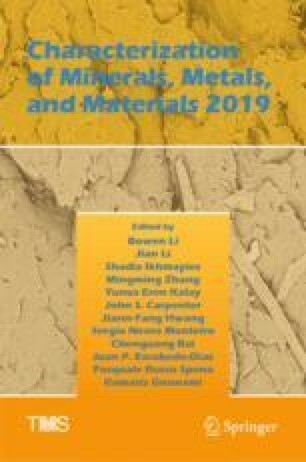 In this study, the magnesium aluminum ferrite spinel was prepared by microwave sintering using magnesium oxide, aluminum oxide and ferric oxide as raw materials. Its generation mechanism was identified by analyzing the phase transformations and microstructure changes of the spinels prepared at different sintering temperatures for variable time using the X-ray diffraction (XRD) and scanning electron microscopy–energy-dispersive X-ray spectroscopy (SEM-EDS). This work was partially supported by the National Natural Science Foundation of China under Grants 51774337, 51504297 and 51811530108, the Key Laboratory for Solid Waste Management and Environment Safety (Tsinghua University) Open Fund under Grant SWMES2017-04, the Project of State Key Laboratory Cultivation Base for Nonmetal Composites and Functional Materials under Grant 17kffk11, and the Fundamental Research Funds for the Central Universities of Central South University under Grants 2018zzts779.